LONDON, 29TH OCTOBER: Next year, petrolheads Mike Brewer and Ant Anstead will roar back onto Discovery for a brand-new series of WHEELER DEALERS. Due to premiere on the Discovery Channel on Monday 7th January 2019 at 9pm, the new series will see experienced car dealer Mike and talented mechanic Ant team up and embark on another monumental motoring mission: to find and restore iconic cars to later sell for a profit at their LA-based shop. In the series, Mike has the challenging job of finding vehicles that have money-making potential. He then hands them over to Ant, who tackles everything from bare metal re-sprays to gearbox swaps to bring them back to their former glory. From the sunny beaches of southern California to the coldest edges of Maine, the series scours the US from coast-to-coast for the best vehicles to buy, restore, test and sell for a tidy profit. What treasures will the guys find and revamp on their epic adventures? 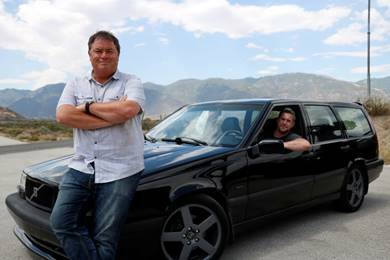 Wheeler Dealers premieres on Monday 7th January 2019 at 9pm exclusively on the Discovery Channel. They're still showing "new" Edd China episodes on Quest, new to Quest anyway.